My wife and I visited our local BJ’s Restaurant & Brewhouse in Folsom for a bite to eat and to try the new Hoppy Scotsman Ale released today (full disclosure, BJ’s comped my bill). I’m not keen on “chain restaurants,” however, I have some fondness for BJ’s. It’s the place I really discovered there were different styles of beer — beer with flavors and aromas. I enjoy their Nutty Brewnette and HopStorm IPA and pretty much hate the LightSwitch Lager. Ugh! 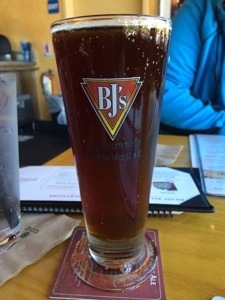 But that’s the great thing about BJ’s; as a beer novice, it allowed me to ease in to Craft Beers. I could discover what I liked and didn’t like before I hit some of California’s premier breweries. Unfortunately, as I developed a thirst for California Craft Beers, I sort of tossed BJ’s aside a not “serious” craft beer. That’s a mistake. BJ’s is the 44th largest craft brewery in the United States and they DO make good beers. Plus, I love Brewmaster Michael Ferguson‘s Beer Geeks television show! The Hoppy Scotsman Ale was developed by the Huntington Beach-based BJ’s and Caledonian Brewing of Edinburgh, Scotland. Click here to see BJ’s promo video. 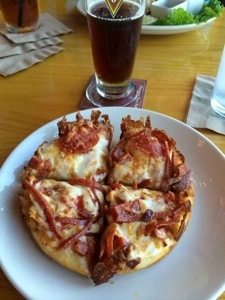 The beer had a nice balance of malts and hops and went well with my deep dish pepperoni pizza. 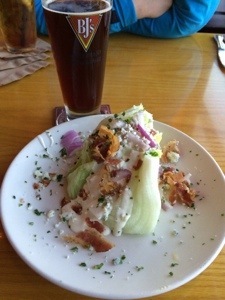 I also had a wedge salad; the combination of the beer and blue cheese was a bit bitter for my taste. The food was plentiful and tasty, but I wish the restaurant’s atmosphere was more like Stone World Bistro than T.G.I.Fridays (just a personal preference). Also, do yourself a favor and DO NOT look at the menu item calorie counts. Scary! The service was pleasant and efficient. There are 64 locations throughout the state and though the company is based in California, the beer appears to be brewed out of state in Reno, NV, Chandler, AZ and Boulder, CO.